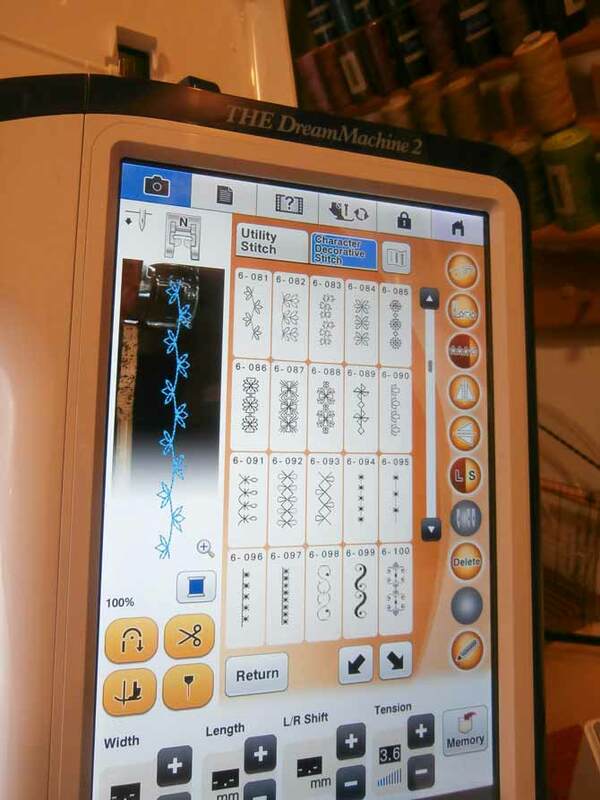 Yesterday I shared my 3 favorite features on THE Dream Machine 2. Today, I have yet another favorite to show you. 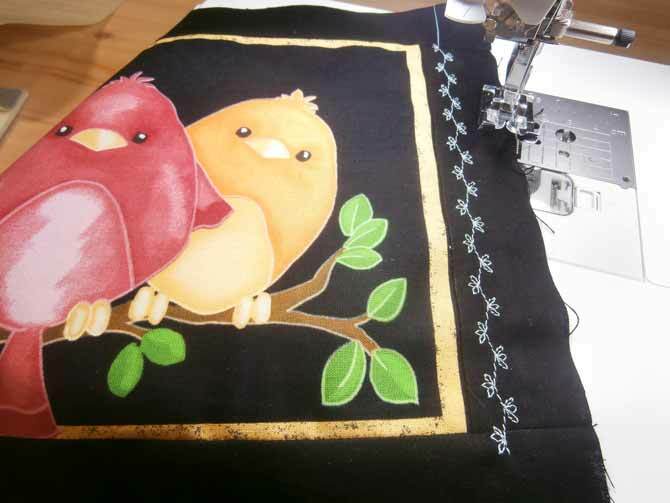 It is mind boggling how much technology has taken leaps into the realm of the needle arts, by providing the sewer and quilter with so many stitching options at our finger tips. 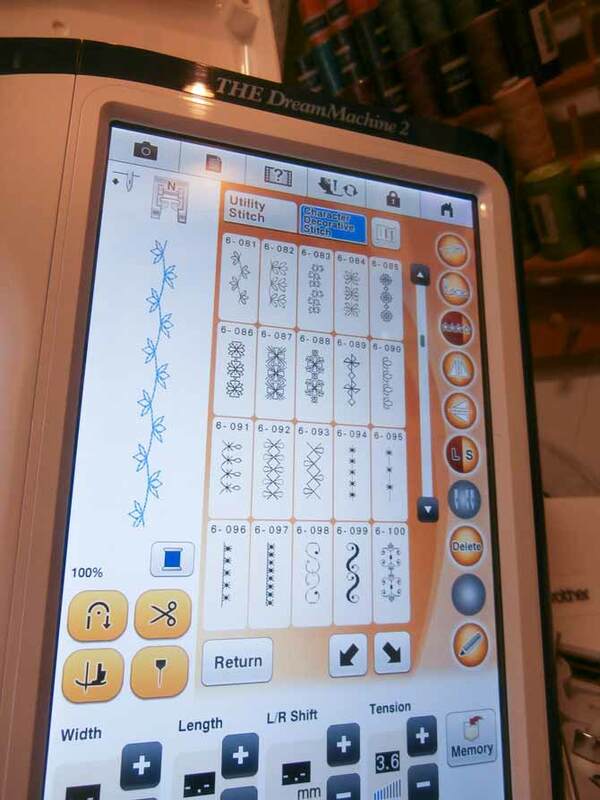 Let’s explore more of those pre-programmed stitches that are on THE Dream Machine 2 for our creative exploration. To start off this adventure, here’s a YouTube video with a virtual stitch review of the decorative stitches. 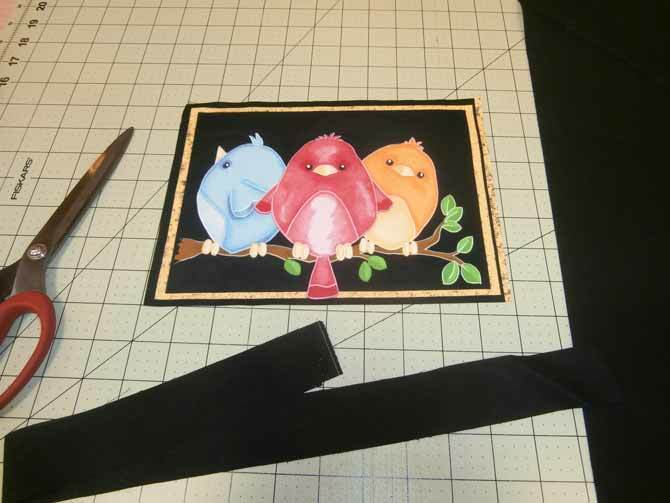 For today’s project I’m going to fussy cut a small portion of a panel that I have in my stash and add a small 1½” border in solid black to give me the base of a small decorative pillow. With the 1½” border added to the panel, I’m going to do a little machine stitching on the black border to embellish it a little. Here are a series of photos to walk you through this process. On the screen, I selected sewing. 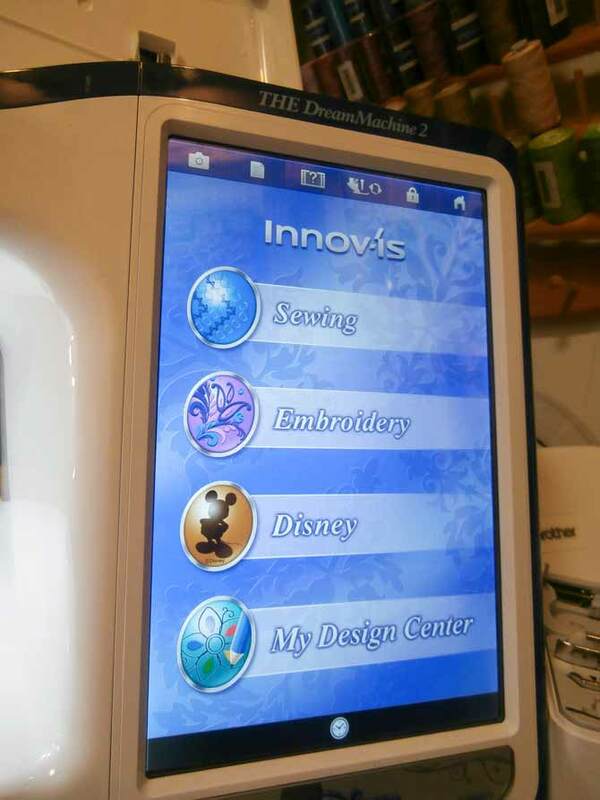 Select sewing on the display screen. Select the box to choose the stitch file. I selected the first box in the first row (6). Select the required stitch, I chose the stitch reference 6-081. To see the stitches, simply press on the arrow to move up and down in the stitch file as in the video above. 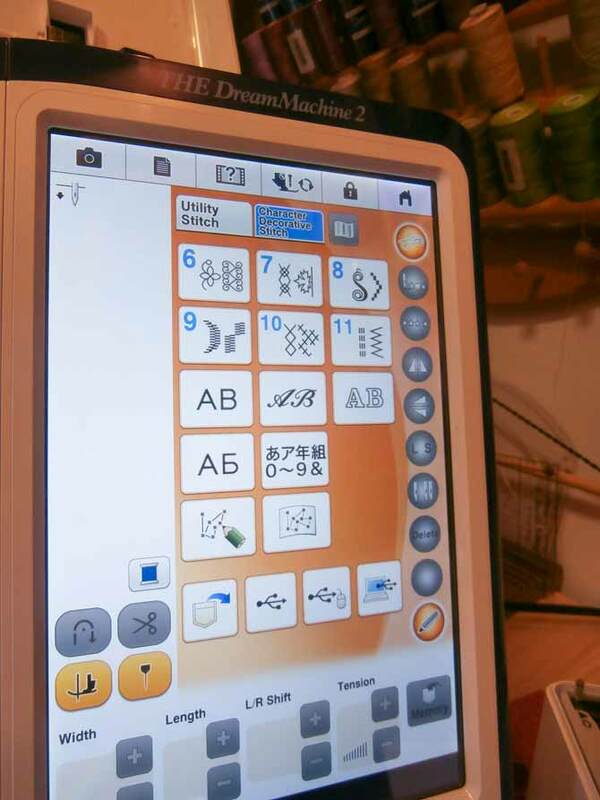 When I choose my stitch I can then see the stitch on the side of the display screen in a continuous format. This allows me to see what the stitch will look like once I add it to my project. The screen displays the right foot to use with each stitch. 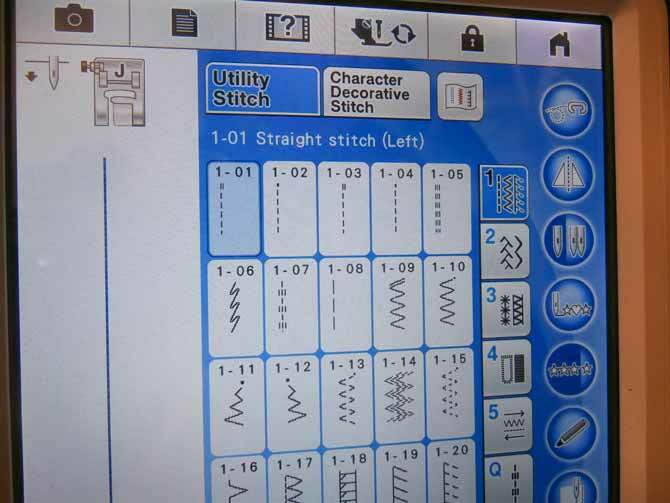 Note: Once you select the stitch the screen will also tell you which foot you need to attach to the machine. For this stitch, I need to use the N foot. There’s a little camera icon in the upper left hand corner of the display screen. 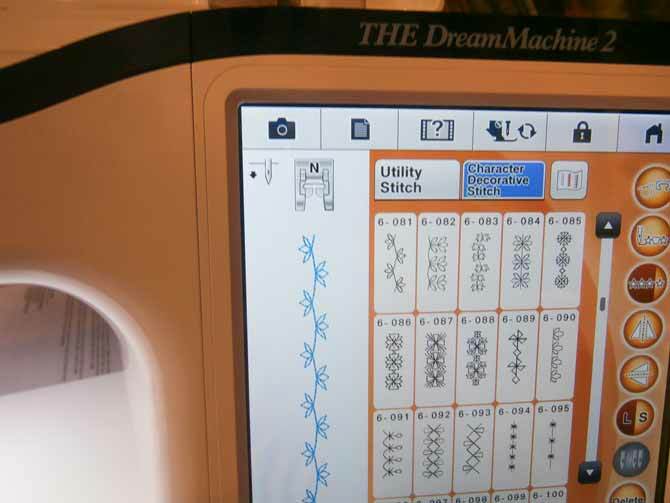 With my project under my needle, when I press the camera icon I can see on the screen what the stitch and thread color will look like once applied to my project. Amazing, like a little built-in photographer?! Previewing the stitch before sewing. Since I loved what I saw in the preview, it was easy for me to start stitching and add this fun embellishment to my project. Embellishment stitch added to the side of my pillow panel. Using this feature, I’m guaranteed endless creative adventures at my fingertips. I’m sure that I’ll be using this feather stitch again in a different project for a whole different reason. Character Decorative Stitch are 3 words that mean more creative adventures for YOU! Meanwhile, be sure to come back tomorrow to see what else I discover on THE Dream Machine 2. Go to part 4: How to test the ¼” quilting foot for accuracy on any sewing machine!